Seamus Heaney, Nobel Laureate and former Harvard professor, recently returned to the Ivory Tower to read selections of his work. 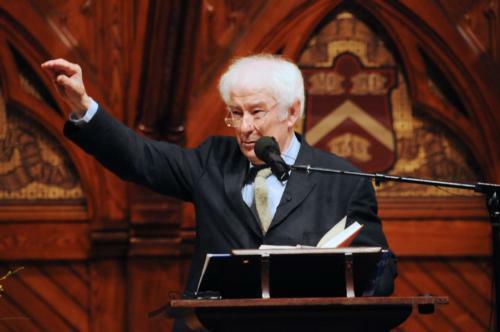 Seamus Heaney, Nobel Laureate and former Harvard professor, recently returned to the Ivory Tower to read selections of his work. He also sat down with FM to talk about lecturing in Sanders Theatre, being Irish, and how poetry could remedy the world’s problems. Fifteen Minutes (FM): How does it feel to be back at Harvard? Seamus Heaney (SH): Well, I feel at home in 02138 because of former colleagues in the University, because of the general good time and good will of my experience, and also because of a lot of good friends in the writing community here. FM: How did you decide which poems to read? SH: I thought I’d read a few Harvard-related things. When I did the Phi Beta Kappa here in 1984, I read a poem called “Alphabets,” so I hope to read that. I never quite know what to read, but the Harvard situation—Sanders Theater, specifically—dictates some things. I read “Alphabets” first in Sanders, and it was written with Sanders in mind. It’s a rather beautiful theater. FM: Your most recent collection of poetry, “District and Circle,” won the 2006 T.S. Eliot prize. What makes this anthology different from the others you’ve published? SH: The title comes from the two underground railway lines in London, the District Line and the Circle Line. London is a new setting for me. It’s haunted by 9/11 and the new world of menace and unease. If you go into an underground train in London—probably anywhere, but chiefly in London—there’s that sense of almost entering a ghostly dimension. People are very still and quiet; they don’t exchange many pleasantries. The speaker is a passenger with a slight sense of strangeness, but he could be somebody about to do something destructive on the train. FM: You’ve had violence influence your work before. Being from Ireland, how did the conflict there shape you? SH: I’m part of the culture, and I’m part of the problem. SH: Everybody in Northern Ireland is infected—well, you’re either one tribe or the other, one guy or the other guy. Your calling as a humanist, as an intelligent creature, is to outstrip the conditions which you are landed with, to get some vision of a cultivated, tolerant, civic society. No matter how well-disposed you are, no matter how personally irreproachable your political or religious attitudes, you dwell in a place which is troubled. You’re answerable to that, especially when violence erupts, and lives are being lost, and lives are being taken. FM: What did that do for your poetry? SH: I like to quote the great Polish poet Czeslaw Milosz: “What is poetry that does not save nations or people?” Most poets don’t really think about that. In a war situation or where violence and injustice are prevalent, poetry is called upon to be something more than a thing of beauty. So there was that feeling of responsibility. FM: The situation in Northern Ireland has seen great progress towards peace. Does this give you hope for other ethnic and religious conflicts in the world? SH: I think they’re all unique. We have the beginnings of structure, of institution, which would allow the divisions to play out politically. But what is being played out in the institution is quite a dangerous energy on the streets. What you want, if possible, is some institutional shape that allows dangerous voltage to enter and work and drive the institution. It doesn’t mean that sectarianism or opposition has gone away in Northern Ireland; it means that there’s a kind of future-seeking possibility in the institution. FM: You’ve said that poetry should offer a “re-tuning of the world itself.” Can you elaborate? SH: If it can. It can’t change the world, but within the poem, things should be re-tuned at least. Maybe eventually, gradually, poems enter the consciousness of individuals, and then of a culture, and then has a general effect. But it’s on sensibility rather than politics. FM: You won the Nobel Prize in Literature in 1995. What was that like? SH: It’s a subject I usually don’t talk about. There’s not much to say about it. I was in Greece at the time, and I didn’t learn about it for two days. I was able to hide for a couple of days and get myself ready. I’ve said it before about the Nobel Prize: it’s like being struck by a more or less benign avalanche. It was unexpected, unlooked for, and extraordinary. FM: Back to your Nobel lecture. You recited a line from your poem, where the narrator says, “Walk on air against your better judgment.” You offered this line as an instruction to yourself and all who listened. What does that mean? SH: A person from Northern Ireland is naturally cautious. You grew up vigilant because it’s a divided society. My poetry on the whole was earth-hugging, but then I began to look up rather than keep down. I think it had to do with a sense that the marvelous was as permissible as the matter-of-fact in poetry. That line is from a poem called “The Gravel Walks,” which is about heavy work—wheeling barrows of gravel—but also the paradoxical sense of lightness when you’re lifting heavy things. I like the in-betweenness of up and down, of being on the earth and of the heavens. I think that’s where poetry should dwell, between the dream world and the given world, because you don’t just want photography, and you don’t want fantasy either. FM: With that award, you join the ranks of fellow Irishmen William Butler Yeats and George Bernard Shaw. What do you think is behind Ireland’s rich literary tradition? SH: I don’t know the answer to that, really. I don’t believe that sociological conditions produce the oddity of talent. Talent is unpredictable. But it does seem to flourish when societies are in search of definition. FM: Then did growing up in Ireland have anything to do with your talent? SH: The world I grew up in was actual, but it was also previous, in a sense medieval. Well for water, light the fire, go to Mass. My first life on that farm in County Derry was hermetically sealed. In my twenties, when I had gone to university, it was almost like opening something that had been sealed. It belonged to me, but in memory, it was already a dream place. That’s very useful to a writer—to have somewhere that has a sense of dream-reality to it. I like things that have both a kind of documentary verité, and at the same time a kind of hallucinatory quality. FM: Besides writing poetry, you’ve also translated many classic texts—the most famous of which may be “Beowulf.” What are the challenges and pleasures specific to translation? SH: It’s different in that you have the given, a shape to work with. You don’t have to conjure the material ‘thingness’ of the poem. It’s more like a jigsaw puzzle than anything else. At the same time, all the definitions of translation that I really like is that it’s writing by proxy. You get the satisfaction of finishing something without the penalty of having to start it. FM: Has translating done anything for your own poetry? SH: Yes, I think so. The first substantial translation I did was from the Irish called “Sweeney Astray” from an Irish poem called “Buile Shuibhne.” Working with a very heavy concrete element of Anglo-Saxon was a counter-weight to what I was hearing in America. It’s a much opener conversational weave. I think of myself as between the two, but I was glad at that time of the substantial element in the language. It brought me back to more of a substantial language of my own. FM: Before we end the interview, I just have to ask: any chance you’ll come back to teach soon? I graduate in 2011. SH: I think now it’s unlikely that I’ll come back to a fixed position. I haven’t been asked anyway. FM: Oh, I’m sure if you asked, they’d let you. SH: Yes...Well, well. It’s a wonderful place to come back to, no doubt. FM: What did you take from your teaching experience at Harvard? SH: I enjoyed teaching here. It’s an ideal place to teach—the quality of the students and the amount of contact you can have with students. I taught for years in Ireland in big lecture groups, and here a writing class was 12 or 14 people. I also enjoyed doing the lectures because I was bringing news of British and Irish poets. I felt I was doing my own culture over there some service here.